[J]ust six kilometers further down the Kings’ Highway, one can find the presumed site of Moses death and burial at Mount Nebo. It is one of the most revered holy sites of Jordan. A small Byzantine church was built there by early Christians, which has been expanded into the vast complex that it is today. During his visit to Jordan in 2000, the Late Pope John Paul II held a sermon here that was attended by some 20,000 faithful. 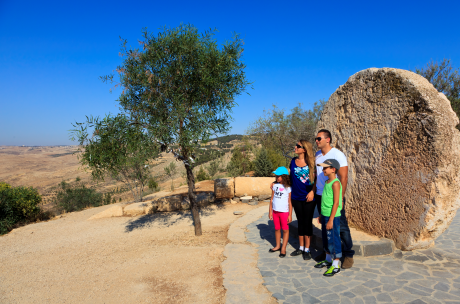 Most visitors to Mount Nebo stand on the platform in front of the church and admire the view. It overlooks the Jordan Valley and the Dead Sea, across to the rooftops of Jerusalem and Bethlehem and is absolutely breathtaking.